IT is a neurotoxin that accumulates in marine organisms and can have serious implications on human health. The toxin, monomethylmercury, is of particular concern to people whose traditional diet consists of seafood. But the source of monomethylmercury in oceans has remained uncertain. It was till now suspected that industries were releasing this toxic mercury in the seas. Now a research by University of Alberta in Canada has found that a relatively harmless inorganic form of mercury found worldwide in ocean water is transformed into a potent neurotoxin in the seawater itself through the process of methylation. This process, the researchers say, is aided by the microbes present in the water, in the presence of sunlight. “We are 90 per cent sure that the methylation process is carried out by microbial life forms like algae in the ocean,” says Igor Lehnherr, biologist and lead author of the study. “It appears that the production of monomethylmercury in seawater is the most important source of it. It accounts for almost 50 per cent of the mercury formation,” he adds. Unlike inorganic mercury, monomethylmercury is bio-accumulative, meaning its toxic effects are amplified as it progresses through the food chain from small sea creatures to humans. “Another implication is that as more inorganic mercury is released into the oceans by industries, more monomethylmercury will be produced leading to higher risks of mercury exposure to marine organisms and humans who consume seafood,” Lehnherr adds. 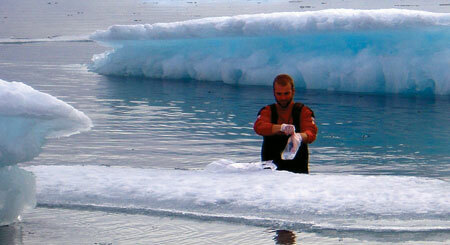 The team collected seawater samples from the Canadian Arctic Archipelago in 2007. The samples were collected from two biologically important depths, the area of maximum chlorophyll fluorescence and hence algal biomass and the area of high heterotrophic respiration and organic carbon decomposition. They then added isotopically-labelled inorganic mercury and monomethylmercury to the samples. The rate of mercury methylation and demethylation was then examined by incubating samples amended with the isotopes in the dark at 4°C for zero, 12 and 24 hours. All the samples were then analysed using isotope dilution mass spectrometry (a technique that measures the mass-to-charge ratio of charged particles). They found monomethylmercury formed from the methylation of inorganic mercury in the samples. Demethylation of monomethylmercury was also observed. The research was published in April in Nature Geoscience.